Combining an ultra pure silica with advanced bonding technology resulted in a densely bonded silica that is both highly robust and highly reproducible. 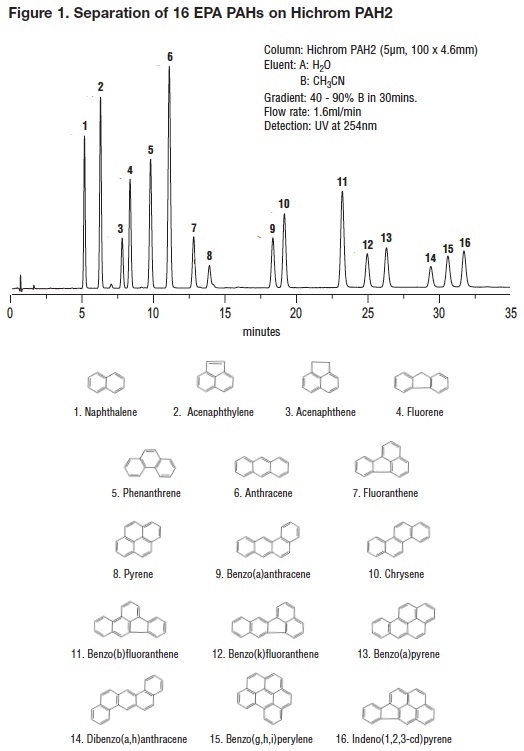 All columns are supplied with a Test Chromatogram and Batch Validation Certificate (Selectivity test report for acidic, basic and neutral molecules; Reproducibility test report for tricyclic antidepressants). 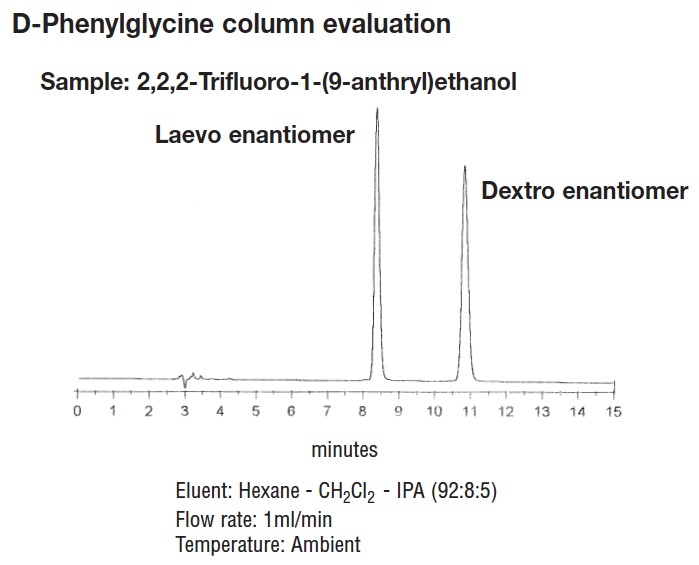 The report on the Test Chromatogram includes Efficiency data (N0.5) and two peak asymmetry calculations (BC0.1/AB0.1 and the much more rigorous N0.1/N0.5). Sample of the QC test mix is available on request. Hichrom PAH2 is based on an alkyl bonded silica material with a high carbon loading, designed specifically for the analysis of polynuclear aromatic hydrocarbons. Hichrom manufactures two ranges of Brush-type or "Pirkle" columns. These columns are designed to give a strong three-point interaction with one of an enantiomer pair. This means they are classified as Type I in the Wainer classification. There are two main types of stationary phases, pi-acceptor or pi-donor phases. The Hichrom pi-acceptor phases (CHIRA-chrom-1 phases, USP L36) are 3,5-dinitrobenzoyl-derivatives of optically active amino acids, covalently bonded to aminopropyl silica. These columns are capable of separating a large range of compounds which include a pi-donor aromatic group. This may be introduced by derivatization with naphthoyl chloride or other appropriate reagent. The Hichrom pi-donor phase (CHIRA-chrom-2 phase) has a chiral dinitrophenyltartramide moiety bonded to the silica surface through a propyl spacer group. This phase requires the analyte to contain a pi-acceptor group such as the dinitrobenzoyl group. The dinitrobenzoyl group can easily be added to a wide range of compounds such as alcohols, amines, carboxylic acids etc. using dinitrobenzoyl chloride, isocyanate or dinitroaniline. The advantages of the "Pirkle" type phases are that they are easily synthesized and are also readily available at reasonable cost. The disadvantages are that the columns will only work with aromatic compounds and that derivatization may need to be undertaken to aid the separation. It is important to note, however, that the derivatization is achiral and so does not present the problems involved in chiral derivatisation. Mobile phases are restricted to relatively non-polar organic solvents which is an advantage in preparative chromatography. By substituting L-phenylglycine for D-phenylglycine, the order of elution of the chiral peaks can be reversed. Such a procedure can be useful in assigning peak identity or ensuring prior elution of the minor enantiomer, thus allowing its more accurate determination. The availability of the D,L-phenylglycine further aids peak assignment by removing chiral separations whilst maintaining background peak retention profile.